Tired of taking your vehicle for frequent repairs? Junk cars do not only take up a lot of unnecessary space but are also hazardous to the environment. Instead of selling your car personally to buyers or dealers, sell your car and get instant cash without any investment or hassle. Throwing expensive advertisements in the local newspapers is not the best way to sell your car. Get free Quote Now.All you have to do is call us and we’ll take care of the rest. Selling your junk car has never been so easy! Our cash for car services in Brisbane make it convenient for you to sell your junk vehicle. If you want to get rid of your scrap car and get instant cash, there is not much to do. Finally, Follow the steps mentioned below and sell your junk vehicle in no time. 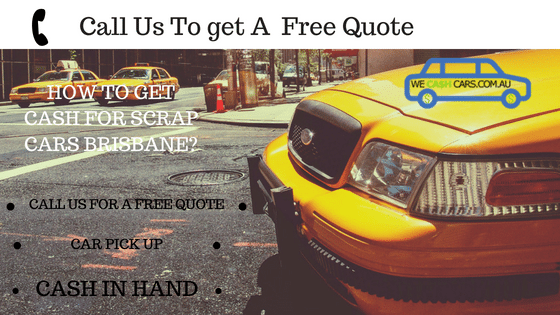 How TO Get Instant Cash For Scrap Cars Brisbane? similarly, Our helplines are open for you 7 days a week. Give us a call 0730826442 and provide all the major and minor details of your car. Make sure you give us the correct details in order to get a higher quote.We also offer you a free quote considering the make, model, brand and condition of your car. You can also complete this procedure online. Fill out an online form for a web quotation and get a free quote for your junk vehicle. Besides that, we also give you a free car inspection. If you want to get instant cash for your scrap car, we’re just a call away! Once you accept our offer, our expert car wreckers reach out to you to tow your vehicle away. They will reach at your doorstep within 24 hours of your call. Our team of skilled car wreckers makes sure they tow your vehicle away without causing any inconvenience.Also, we do not charge anything for the services that we provide. We tow your car away for free! In fact, forget the hassle of legal paperwork. We arrange all the required paperwork for you. You will not be charged for any of the services we provide. Call us and get your car towed away for free. As a result, We will pay cash On The Spot in Your hand right after we tow your car. We assure you the most competitive price for your junk vehicle. Sell your cars, trucks, SUVs, RVs, boats or any other vehicle. We pay you top cash for any junk vehicle. We do not add any charges or hidden fee in the final amount. Sell your junk car for top cash without any hassle or expense. We cash cars is a reputed car removal company in Brisbane. We buy any and every kind of vehicle. No matter which brand, make, model or condition, we pay you top cash for your scrap car. We willingly accept cars in any condition. Your vehicle can be junk, broken, damaged or even accidental. We realize the worth of your vehicle and pay you the most competitive prices for it. Our cash for car services are absolutely free of cost. We cash cars is Top car Removals Company in Brisbane. We buy Unwanted Vehicles and further use them for reselling or recycling. These recycled cars are using an innovative methodology and latest technology. Hence, we make sure that we contribute our bit to the environment. Call Today.